Richard Waterhouse (1832-76), Brigadier General, CSA. Participated at Milliken's Bend (Louisiana), Mansfield, Pleasant Hill. Autograph Letter Signed (ALS), 2 pages, 4to., Camp Texas, La., Aug. 24th, 1863. 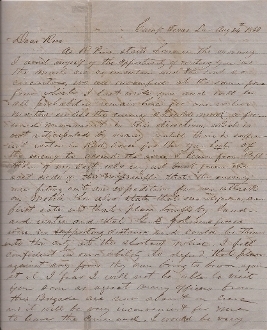 Waterhouse writes to his wife Rose pertaining to the Red River campaign. Your affectionate Husband R. Waterhouse." Reinforced fold splits, otherwise fine. Good content letter from a scarce general.